Just before citizens of the world rang in 2019, Hilde and Sunniva met up in Hilde’s hometown of Longyearbyen, Svalbard. Planning for a remote 9 –month Expedition is a complex web of tasks, lists, calls, emails and follow- through. Whatever time we can spend together is invaluable. It’s also a smart move since we are going to be spending a loooong time together in a small space- getting along would be absolutely necessary. To spice things up I bought Hilde a pair of Everlast boxing gloves for those “off days” at Bamsebu. I bought myself a pair too, the perfect way to get exercise and release frustration. We tested our Iridium and Garmin devices and sent test messages to Sandy O’Keeffe, our web designer in Boulder Colorado- success! We went over our sponsor lists- who is onboard, what they pledged, who to cross off and who to reach out to. We had several in-person coaching sessions with our mental trainer- Carina Vinberg who flew in from Sweden. We had Skype calls with: Partner Fabian Dattnerfrom Homeward Bound (See what Fabian has to say about Hearts In The Ice), who is leading 1000 women in STEMM on a 10year climate change project that ends with an 18-day voyage to Antarctica. We had a most interesting talk with Advisory Board member andSponsor Peter Neill from the World Ocean Observatory- an ocean leader and pioneerhe was instrumental in getting us a testimonial from Sylvia Earle for our project. We spoke to both Alison Lee from Scripps Institution of Oceanography and Marile Colon Robles from NASA’s cloud observer program about the instruments we will be using to collect the data for the phytoplankton/Fjord Phyto project and the 2 specific cloud types unique to the Arctic that we will be photographing for the 6 different Citizen Science Projects that we have committed to. We managed to catch up with Advisory Board Member PHDGeir Wing Gabrielson– author of “Plast I Havet” Plastics in the ocean. A man who has spent 30 years studying the harmful impact of plastics including the fact that when the birds eat plastic they develop a viscous lining on their intestinal wall that makes it impossible for them to digest “any” food so they starve to death. We will also look for toxid in the ocean. 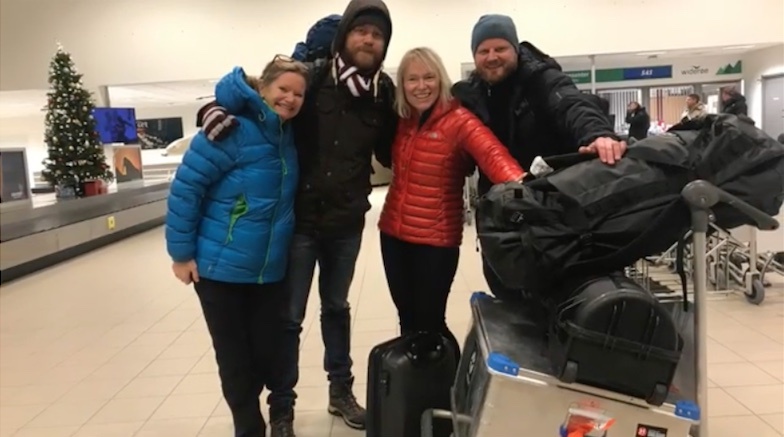 We visited with our Advisory Board Member Torgeir Mørk at the local Airport. He shared his history as a meteorologist for the past 30 years and changes he has measured. This was on a day when it rained more than rainfall in the entire month of December (at Ny – Ålesund which is x miles from Longyearbyen). Climate change in the Arctic impacts all. We had lunch with Pål and Linda who had just finished a year of overwintering together at Austfjordneset, Svalbard. Among the many things they shared they cautioned us against “expectations” and their story about a thwarted boattrip ride to meet up with a ship to collect needed and much anticipated provisions. A Polar Bear paced outside their hut for days, making the ride to meet the ship impossible. We also went to the training center to get in a few workouts which were much needed. We ended our in-person meetings with the Int’l Director of the Norwegian Polar Institute and our Advisory Board Member- Kim Holmen. As it turns out our meeting with him was on the 3 year anniversary of a devastating avalanche in Longyearbyen when heavy snows and high winds in a short period of time all collided to make for the “perfect storm” Dec 19th2015. Below is a fact-finding Q & A with Hilde and Kim Holmen on the subject of the changing climate in the Arctic. Hilde: Is it true that there has been temperature increases in subsequent 92 months on Svalbard and that the average temperature has increased by almost 4 degrees? Hilde: Less ice on the fjords and more ice on land. At the turn of the 1900 century and the beginning of the 2000 ice in the fjords froze and we were always iced in during wintertime. Now it is more and more common that it does not ice up, but that we get a lot of ice cover on land, is this a trend? Hilde: Glaciers retreat to a greater extent than a normal cycle may indicate? T he sea maps are no longer correct. Monacobreen has retreated more than 5 kilometres in the fjord. Hilde: The place was called Arctic “Desert” when I came to Svalbard in 1995. Now it rains both summer and winter and we find that rivers go up in the middle of winter and more snow and that avalanches have taken houses and that landslides become more common. Kim Holmen: Svalbard has always been the most humid place in the Arctic. There are big differences in precipitation on the west coast an the east coast of Svalbard. Yes, more rain (and more often during winter) Galciers are increasing at lower altitudes, but more rain/snow gives more snow to the higher part of the glacier (above 400 meters) – and more humidity in the warm atmosphere. Hilde: Grass in the city. There used to only be grass behind the old Barn/museum and in the sewer leak below Blåmyra and under bird cliffs. Now it’s green all over the place..? Kim Holmen: We do see changes in the vegetation. We do not have alot of data yet, but we can see that vegetation responds to warmer and more humid environments. Kim Holmen: The Arctic is not simple. There have always been great variations in short term. We do have data that shows more occasions of increased degrees during winter. Before we maybe had one big rainfall every 5th year. Now we see several incidents of heavy rain every winter. On behalf of the Hearts in the Ice team – we extend our profound thanks and gratitude to the following sponsors that have pledged financial sponsorship and science support for the expedition! Lastly, don’t forget to watch the video montage of our trip! Wow! This is really happening! So proud to be (a tiny part), of the Hearts In The Ice Bamsebu project. Hilde and Sunniva – you go! The more I read about your incredible project the more impressed I am with your undertaking. It’s magnitude, the complexities, the logistics and your personal commitment is beyond impressive. All this plus the invaluable scientific information you will be getting and sharing makes this an important research project to share with the world. Good luck to both of you. It is INCREDIBLE that this expedition will bring so much current information to researchers and people like me and provide a spotlight on the Arctic and Antarctic regions. wow – following every step! thanks for sharing how this all comes together.